It’s difficult to think of a writing team of opposites whose work together (albeit, each from a different century) creates a near-perfect weaving of mystery and wit. Hartford Stage’s “Murder on the Orient Express” is a seamless script with elements of illusions and macabre from Queen of Crime author Agatha Christie placed in the hands of Ken Ludwig, one of the 21st century’s best playwrights whose forte is humor. Hartford Stage’s production presents its audience with a gift – which on every level looks like the exact image of an authentic train called The Orient Express, complete with a cast of a dozen dazzling characters. Before any significant action, it is clear that a story of upper crust glamour is about to hit the rails. Equal to the talent of the play’s director and actors is the exquisite precision by set designer Beowulf Boritt, sound designer Darron L. West, and costume designer William Ivey Long. Spotlight’s reviews usually end with a short comment or two on the accomplishments of those backstage geniuses. In the case of “Orient Express,” this triumvirate of talent must be given special accolades. Boritt’s creation of the exterior and three-car interior of a decadent mid-20th century European train, West’s music and sound effects’ programming, and Long’s expensive fashions are nearly as important as the actors in telling Christie and Ludwig’s story. Over the years, many Hercule Poirots have taken to the movie screens and television, conjuring up various personal images of this private investigator extraordinaire. Actor David Pittu, creates our over-dressed, well-spoken, intellectual hero. With Ludwig’s dialogue and emphasis on merriment more than mystery, Poirot reminds us of a dignified Inspector Colombo. 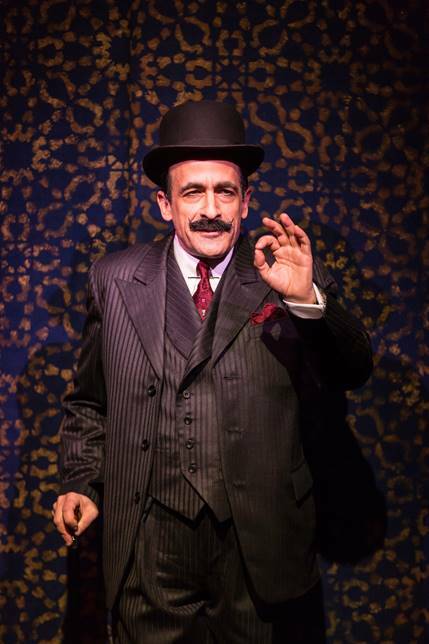 Pittu is a slight man, yet in his own quiet way presents a Poirot whose presence shadows all other actors, as he well should. Pittu does, however, have competition from Julie Halston, an excellent actress playing a poor actress – that must be difficult. Emily Mann has directed her cadre of actors to play over-the-top, befitting their characters, aka suspects. For the fifth “Masterworks Series” program of the HSO’s 74th season, Music Director Carolyn Kuan presented what the orchestra’s web site billed as “a night of epic love” in music for Valentine’s Day weekend. The concert began with a ravishing performance of the tender “Intermezzo” from Pietro Mascagni’s beloved 1890 one-act opera of tragic, doomed love, Cavalleria Rusticana. This was followed by an affectionate account of Haydn’s last symphony, the fruit of a mutual love affair between the Austro-Hungarian master and his British admirers. Nicknamed the “London” for its rapturous reception there in 1795, this 104th symphony features a spacious opening “Adagio-Allegro,” a gripping theme-and-variations “Andante,” a courtly “Menuet,” and a sparkling “Spiritoso” finale. It glowed in the warmth of a classically reduced HSO. The second half of the evening belonged to the Anderson and Roe piano duo, formed in 2002 by Greg Anderson and Elizabeth Joy Roe as students at the Juilliard School with the mission, in their words, “to make classical music a relevant and powerful force around the world.” Their first two selections included full orchestral backing. The mercurial opening movement of Poulenc’s “Concerto for Two Pianos and Orchestra,” reflecting his love of Parisian popular music, was humorous and unpredictable. Anderson’s imaginative “Fantasy on Bizet’s Carmen for Two Pianos and Orchestra” showcased even more virtuosity by all the musicians, especially the soloists, in another story of love and death. But they came into their own when the orchestra left the stage. 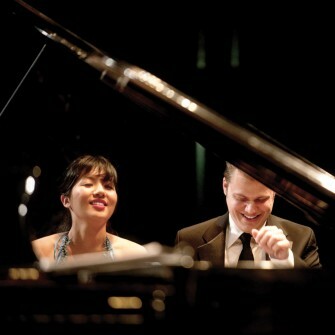 After a lush “Night of Love” movement from Rachmaninoff’s first suite for two pianos, the duo moved into livelier territory with four excerpts from Bernstein’s Romeo-and-Juliet update, West Side Story. By their finale, a tempestuous “Tango” by Astor Piazzolla, they had switched seats several times at one piano, reached across each other’s hands at the keyboard, and plumbed the piano strings in a full-on display of the high spirits that have made them a YouTube sensation. Alongside Kuan in Oprah mode, Anderson and Roe introduced each piece with engaging commentary, earning extra kudos from an enthusiastic audience that would welcome their early return to Hartford. The numbers add up well for the 7th annual “10X10 New Play Festival” as 6 actors portray over 20 roles in 10 plays (each 10 minutes in length) penned by 10 playwrights under the astute direction of 2 creative professionals. Although I don’t know the number of seats at Barrington’s St. Germain Stage, the plays hosted a full house for its opening performance. While the plays are short, each is a complete full story with a beginning and end. Other common denominators include: small casts, very little staging, few props, and costumes pretty much off the rack (except for one). Judiciously connecting these “playettes” (it’s fun to coin a word) are music and sound effects. Segues are filled with ideally selected and arranged well-known songs or improv jazz. In other words, it’s a fast afternoon at the theatre. 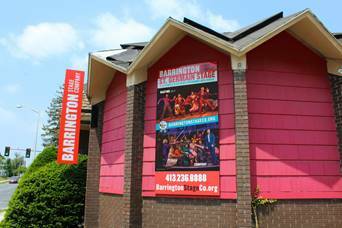 Isn’t it wonderful for Barrington Stage to highlight the works of so many writers? Some playettes work better than others, but remember than none are destined for Tony Awards, and are only 10 minutes long. My favorites include: “Seven Minutes in Heaven,” depicting the awkwardness of a young teen couple wannabe; “Perspective,” taking the subjects off a Michelangelo-type canvas, giving them New York accents and contemporary swagger, and dissing Mona Lisa’s obviously fake smile; and “The Secret to a Healthy Relationship,” demonstrating how a romance can go awry in a matter of minutes. 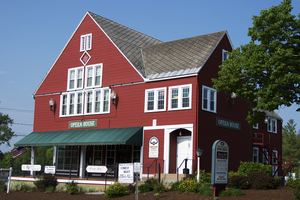 This exciting and hugely successful Barrington Stage program is a significant component of Pittsfield’s 10X10 Upstreet Arts Festival which also features art exhibits, films, museum activities, poetry, and dance. Pittsfield, like many middle-sized somewhat snow-covered New England cities is “open” to visitors seeking arts and culture in the off-season. Classical music, for me, falls in the similar category of not knowing the subject matter very well. Admittedly, my understanding of music far exceeds that of dance. Yet, I can’t quite define words like fortissimo, and others with Latin roots. That said, this “review” is one for people who like, even love, music but are by no means an expert. I am guessing that this is a large group who made up the near-full house at Symphony Hall last evening. My guess that the primary reason for the near-full house at Symphony Hall was the performance of Vivaldi’s “The Four Seasons.” Many of us have heard segments of this popular classical music. However, the SSO and solo violinist Caroline Goulding had their work cut out for them, playing all four movements in full. Goulding stood for the program, instrument in hand, looking at her sheet music on the stand in front of her, literally putting her entire body into the concert. This petite young woman brought each season to her audience with unexpected power. As much as Vivaldi was the “draw,” Beethoven’s Symphony No. 7, Op. 92 was so mesmerizing that, frankly, I forgot to take my usual review notes. Occasionally closing my eyes brought the piece even closer to my soul. I was unfamiliar with this particular Beethoven work. Yes, I liked it. I loved it. Venue – Symphony Hall is the acoustically and aesthetically premiere venue in the Pioneer Valley. If you’ve never visited, take a short walk-about at an SSO concert, especially to the second floor Mahogany Room. Text Messages – A new element for some audience members to enhance their symphony experience are tidbits of information displayed on Iphones simultaneous with the notes performed on the stage. Not being technologically savvy, I did not participate, but many did. Program Book – It’s chockfull of information on the selections, soloists, conductor, and composers. No worries, a “Jeopardy” quiz will not follow. However, given some insight adds to the enjoyment and understanding of the classical music. Apparel – Remember the years when it was mandatory to wear your best duds to the symphony and similar cultural happenings? While I think it’s lovely to dress up to add a bit of elegance to your evening, the dress code has changed. I don’t recommend cut-off holes in the knees jeans, but just about anything comfortable goes. Advice to the novice classical music listeners – several SSO concerts remain in its 2017/18 season. Check their website, then check them out. For the fourth “Masterworks series” program of the HSO’s 74th season, guest conductor Stefan Sanderling took his listeners on a musical journey through Scotland. The concert opened with “An Orkney Wedding, with Sunrise,” which the Boston Pops commissioned Sir Peter Maxwell Davies to write in 1985. Born in Manchester, England, Davies had lived in the Scottish Orkney Islands since 1970, and after depicting a local wedding and its drunken aftermath, this 13-minute piece concludes with the next day’s sunrise, “denoted,” in Davies’ words, “by the entry of the bagpipe.” Kilt-clad Manchester (CT)-based piper Mike MacNintch processed dramatically from the rear of the Bushnell’s Belding Theater to the stage, and the delighted audience rewarded him, the HSO, and Sanderling with a standing ovation for their vivid performance of this colorful score. The evening’s second soloist, violinist Gareth Johnson, was next featured in a riveting account of Bruch’s 1880 “Scottish Fantasy,” whose four movements quote several Scottish folk songs. With technical flair and an interpretive maturity beyond his thirty-two years, the accomplished soloist captured all the piece’s varied moods, from the poignancy of the opening “Prelude,” the buoyancy of the surging “Allegro,” the ardor of the lyrical “Andante Sostenuto,” to the bracing grandeur of the “Finale.” HSO principal harpist Julie Spring excelled in her featured role, while orchestra and conductor provided exemplary support. Intermission was followed by a thrilling rendition of Mendelssohn’s third symphony, inspired by his 1829 visit to Scotland and nicknamed the “Scottish” symphony by the composer himself, who quotes not a single folk tune in its four movements, which are played without pause. From the brooding opening and stormy development of the “Andante…Allegro,” to the exuberant high spirits of the “Vivace,” the sublime rapture of the “Adagio,” and the lively excitement, then majesty of the finale, Sanderling drew passionate, committed playing from all sections of the ensemble. Son of the late legendary conductor Kurt Sanderling, whose gravitas he mixed with a lighter touch, Stefan Sanderling made a distinguished HSO debut with this program and, from the audience’s warm reception, he would be welcome to return anytime. Imagine Shakespeare with punky dyed hair, ever-so tight black leather pants, shirt open to the naval who could pass as Sting’s identical twin. He is one of the 30 or so characters in the hilariously funny “Something’s Rotten” […as “in the state of Denmark”]. The title is an instant clue that, to some degree, “Hamlet” will be significant. But, you say, I don’t like Shakespeare, don’t understand it, haven’t read a play since high school, and left my Cliff Notes at home. Not to worry. 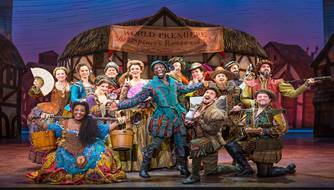 Playgoers familiar with The Bard have a slight edge up on appreciating “Rotten,” however, the humor is accessible to everyone. It also helps to be a Broadway buff. Written by brothers Wayne and Karey Kirkpatrick, their story’s leads are brothers Nick and Nigel Bottom, poor wannabe playwright contemporaries of Shakespeare. While the latter is #1 on the Best Seller list, Nick & Nigel have yet to even make the bottom of the list. “Rotten” is their journey from obscurity to continued obscurity. Sounds like a downer. Ah, but there’s the rub – this show is the exact opposite. In fact, it is one of the most sidesplitting musicals I’ve seen. The N&N duo are so naïve and sweet at the center of the saga, while most of the uproarious comedy surrounds them. Rob McClure (Nick), Josh Grisetti (Nigel), and Adam Pascal (Shakespeare) star. McClure is a slight man with a loud voice whose character has big hopes. We love him. Grisetti plays nerdy to perfection. It’s not until Act II that the audience is given the opportunity to hear his magnificent tenor voice. Pascal portrays pompous with a capital “P.” His lines and lyrics are so fast that you might have to strain your ears a bit to catch up with his words, but it’s worth the effort. Pascal’s “Hard to Be the Bard” is my favorite. “Rotten” is a rare musical. Just when you think you’ve seen the absolute funniest section of a song/dance number and you think the piece can’t possibly be better, it tops itself. “A Musical,” the show-stopper in Act I, and “Make an Omelette,” the Act II show-stopper are perfect examples. “Rotten” is jam-packed with hummable songs (ballads, country, gospel, and lots of rock), rapid-fire tap-dancing (the dance-off between Nick and Shakespeare is a hoot), colorful period costumes, and musician quartet (sounding like a full orchestra). Kudos to the Bushnell on its opening night full house for a relatively new musical.